North Bergen, NJ, SEPTEMBER 28, 2018 – With mosquito-borne diseases in the United States at an all-time high and their impact widespread, EcoRaider emerges with timely announcement of ER-3, their next generation mosquito and pest control product. This affordable pest treatment is the easiest and most cost-effective way for pest control professionals to increase mosquito program revenues with a green, 25b exempt product that does not require spray notifications. In a crowded market, EcoRaider ER-3 stands out above the rest with a solution that not only terminates adult mosquito populations, but offers spatial repellency to keep mosquitoes from the area and kills larvae to prevent future generations. This triple action formula replaces other larvicide treatments, saving you on product costs and service time. Mosquitos are the deadliest creatures globally by annual number of human deaths and birth defects. In an effort to keep homeowners and their families safe while remaining eco-friendly, this triple action breakthrough formula is effective, yet green and non-toxic for children, pets and wildlife. When it comes to increasing revenue and reducing treatment times, EcoRaider ER-3 is the clear solution. It can be diluted down by 4-8 oz per finished gallon and used for triple action mosquito treatment as well as other dilution ratios for general pest control purposes. Safe and efficient, this treatment can be used for more than residential neighborhoods. Pest professionals can now grow their businesses beyond backyards by expanding their offerings to include special events such as outdoor parties, weddings, festivals and more. 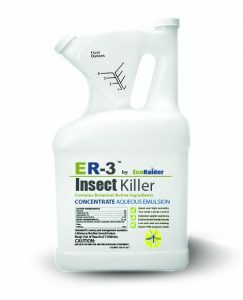 As a triple action formula, EcoRaider ER-3 reduces treatment times, delivers lasting spatial repellency, and provides cost-efficient results in one treatment. 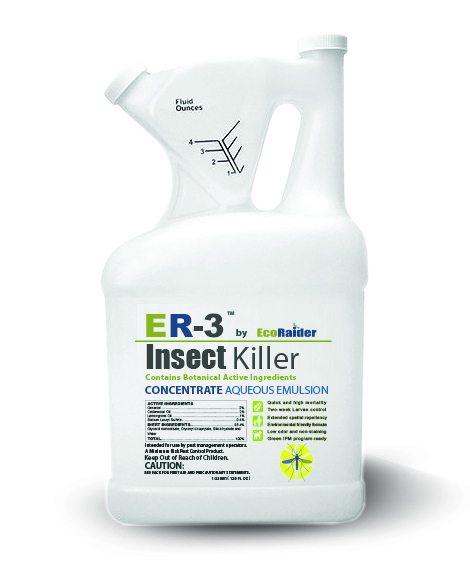 EcoRaider ER-3 is a 25b minimum risk pest control product and can be used with fewer restrictions yet delivers high effectiveness that can outperform traditional pesticides. EcoRaider ER-3 will be available at a distributor near you starting Nov, 2018. For more information visit ecoraiderpmp.com/er3.